Join the JumpStart friends in a rich world full of learning, music, and creativity! 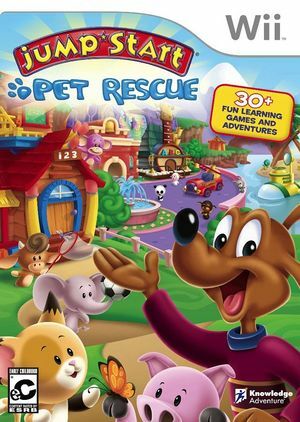 JumpStart Pet Rescue contains 5 Discovery worlds where Preschoolers navigate through 5 stories in a search for lost pets. Each Discovery world contains a guided story told by one of the JumpStart friends, leading children on a learning adventure through more than 50 learning lessons and 20 activities that teach kids over 75 essential skills they need to succeed. As kids progress through the adventures, they improve their pre-reading skills, memory, creativity, motor skills, listening and much more! The graph below charts the compatibility with JumpStart: Pet Rescue since Dolphin's 2.0 release, listing revisions only where a compatibility change occurred. This page was last edited on 10 February 2018, at 04:19.